LONDON: Jurgen Klopp pinpointed a mounting injury list as the explanation for Liverpool’s sub-par performance in a 1-1 draw at West Ham on Monday that leaves the league leaders just three points clear of Manchester City. Victory over Everton today will now take City to the top of the table, while Tottenham are just five points off the top in third. 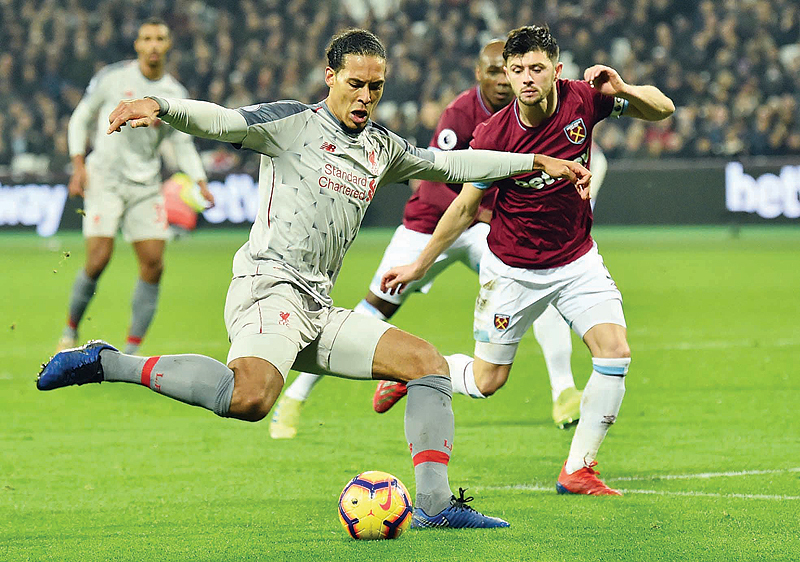 It could have been even worse for Liverpool had Declan Rice and Mark Noble not failed to hit the target with huge chances to claim all three points for West Ham. “Last night we trained and after we had to change three positions,” said Klopp. “It’s just a fact, it’s not an excuse. The preparation for the game was far from being perfect and we still got a point.” After posting a perfect record against opposition outside the top six in their first 23 league games, Liverpool have now slipped up twice in as many matches to mount the tension in their chase for a first title in 29 years. However, Klopp played down suggestions it is the pressure and the weight of history that has dragged his players down over the past week. “It’s not about pressure, it’s about enjoying the situation you are in,” added Klopp. “We have 62 points, have lost one game in the whole season so far which is very positive. “I think from your faces already you (the media) feel sorry for us. We are fine. Tonight was just a tough game.” Hammers boss Manuel Pellegrini claimed it was “impossible to play worse” after his side’s 3-0 capitulation to Wolves last week that followed a deeply disappointing FA Cup exit to League One AFC Wimbledon. “Klopp is used to win with offside goals. He beat me against Malaga with Borussia Dortmund with a goal seven metres offside, so he can’t complain about nothing.” Liverpool’s lead lasted just six minutes as the visitors switched off from a well-worked free-kick and Antonio drilled Felipe Anderson’s pass in off the far post.